Harley Davidson is known for producing iconic bikes. These motorcycles have an immediately recognizable presence. When you spot one on the road, you can immediately identify it as a Harley. Even in this line-up of recognizable and iconic bikes, the Sportster stands out in a startling way. The Sporster has helped the company stay ahead even when the competition was tough. Even after all these years, the Sportster remains one of the most popular bikes amongst the motorcycle community. Before the Sportster was introduced, Harley designed the Model K Sport and Sport Solo bikes to combat competition. There was nothing wrong with these bikes. In fact, they were actually a step up from the old but reliable WL bikes that Harley offered in the mid-weight category. They came with great design improvements like a single, compact motor, flywheels, gears, crankpin, cams, four-speed transmission, etc., were all inside a set of cases. This made the bikes light-weight and fast. While the Sportster’s predecessors were created in response to the British competition, they just couldn’t keep up with bikes like the Triumphs, the BSAs, and the Nortons. These British icons had gained a considerable fan-following and were dominating the roads. Until that point of time, Harley’s only competition had been Indian and that company trailed behind Harley in terms of speed, innovation, and design. On the other hand, the British bikes had raced ahead. When the British bikes started to eat into Harley’s market share, it quickly became apparent that something had to be done. Bikers wanted lighter, faster, and more versatile bikes but the ones that Harley offered weren’t up to the mark. That’s when Harley started working on the Sportster. The Sportster was first introduced into the market in 1957, it was a much needed upgrade from the Model K Sport and Sport Solo bikes that bombed in the market. It retained most of the characteristics of the Model K, including displacement, the frame design, the large gas tank, fender design, and front suspension. On the surface, the Sportster looked remarkably similar to the K and KH models that were introduced just before it was launched. However, there were some significant changes made as well. These changes had a massive impact on the weight, handling, rider-experience, and the speed. The new Harley had a new overhead valve engine instead of a flat-head engine. The engine rocker boxes and cylinder heads were made from cast iron, earning the bike the nickname ironhead. This bike was a sure fire winner and there’s no other way to describe it. It not only competed with the British bikes, but it also won Harley a loyal fan base. Bikers loved the new streamlined design and performance. The Sportster is probably the longest continuously manufactured motorcycle in the world. It has existed in some shape or form since 1957. The company certainly didn’t stop production or innovation after the first year. In 1957, Harley had produced only 1,983 Sportsters and they sold like hotcakes. Pretty soon, it was nearly impossible to get a hand on one and the demand for it escalated. In 1958, Harley introduced models XLH, XLC, and XLHC. These models had higher performance, better handling, and were much faster. The XLC was considered the racing version of the bike. The XLCH was the off-road version and was much faster and streamlined than other bikes of the Harley line-up. It had staggered duals and a peanut tank that helped the bike outpace all competing British machines. This was Harley’s bestseller for a very long time. After that, the Sportster kept soaring. In 1960, the production rose to 2,765 units, which was a 40% increase. But increasing demand kept pushing the company to produce more. 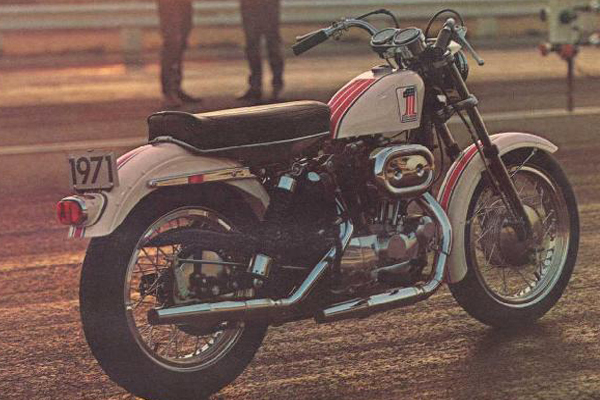 In 1967, Harley had to raise the bar again and produce 4,500 units. By 1970, the Sportster’s reputation was well-established. It was the bike that every kid wanted. To keep up with the demand, that year Harley increased production to 8,560 units. In 1974, the craziness hit its peak when Harley manufactured a whopping 23,830 units of its popular Sportster. But at this time, all wasn’t well for Harley Davidson. The company had been bought out by AMF in 1969 and the quality of the bikes dropped seemingly overnight. For years, the company had to deal with budget cuts, manpower cuts, low-quality materials, and other such problems. This had an impact on the Sportster as well. While it was still their bestselling product, the competition was moving in. Better and safer bikes had entered the market. The Harley executives bought the company back from AMF and started to make sweeping design changes. In 1986, the Ironhead officially retired and the Sportster Evolution was introduced to the market. The bike now had the Evo engine with aluminum heads and cylinders. This metal wasn’t just lightweight and durable, it also reduced oil leakage. The engines were 883cc and 1,100cc and included a four-speed transmission. In 1988, the low-seat Hugger was introduced to the market, targeted at younger riders and ladies. Unfortunately, that had an impact on the sports bike image of the Sportster. But not for too long- In 1991, the bike got an upgraded to a five-speed transmission, rubber-mounted footpegs, and a belt drive; that was the beginning of another era of improvements. Harley Davidson added a belt drive in 1993 and this ensured the bikes were a little quieter and required less maintenance. Bike owners didn’t have to tighten the chain or oil it once every few thousand miles, which led to a significant improvement in their performance and durability. In 1994, the XL Sportster series got new electrical system. It had sealed connectors and an improved clutch, which also had an impact on the overall performance of the bike. The company focused on engine performance rather than the looks of the Sportster so all the bikes retained the classic design but offered a great riding experience overall. By the year 2000, four-piston calipers were a standard in all Sportsters. They gave the bikes better stopping power and improved overall reliability. However, it wasn’t until 2001 that Harley came up with something truly significant. The company launched the 883R, which was a semi-blacked-out bike with a paint scheme reminiscent to the old XR750. This design was instantly popular and significantly boosted sales. The 883R combined modern bike tech with classic racer looks, which appealed to Harley fans as well as common bike buyers. The new 2004 models had better features and offered more rider comfort. The most noticeable difference was in the frame and motor mounts. In the past, all Sportster motors connected to the chassis with solid metal mounts. The 2004 revamp changed this 47-year old design and added insulated motor mounts to reduce the vibration. This also altered the overall design of the bike and gave it a ‘beefier’ look. Davidson removed the transmission trap door and changed the location of the exhaust balance pipe. Many new features were added to the bike because of the fluctuating fuel prices. Customers simply couldn’t afford to purchase and maintain gas-guzzlers and Harley had to adapt to this problem in order to keep up with the times. In 2006, we saw the introduction of the XR1200 with Down Draft DDFI II fuel injection. This bike was revealed in Germany and Harley released a version of it in the US in 2007. This proved to be a hit with the Harley fans and was often featured on racetracks. Since 2007, the company has started to take user feedback seriously. Harley-Davidson is now focused on widening its Sportster model line based on the tastes and preferences of the thriving Sportster fan base. Newer Sportster models often draw inspiration from the custom chopper styles that were prevalent in the 70s. In fact, Harley often holds art gallery shows and displays this showcase engine styles from modern artists. Over the next decade, Harley learned that customers appreciated classic design with modern specs and technology. All current bikes have this winning combination and all of them have been relatively successful in the market. In 2010, Harley introduced the XL1200X “Forty-Eight”. It has styling similar to the classic 1948 built. This model has a small peanut tank, forward controls, wire wheels, and a wide front tire. It also has a chopped front fender, a low solo seat, a slammed speedo, under mount mirrors, and low suspension. In 2012, the company went back to the 70s type styling and introduced the XL1200V “Seventy-Two” model. This bike had a peanut gas tank as well and came with white wall tires, forward controls, longer front forks, chopped rear fender, low single solo seat, side-mounted license plate, low suspension, and a set of mini-ape hander handlebars. This bike could easily reach a top speed of 108mph and was a beast of a machine. In 2016, the company introduced the sporty XL1200CX “Roadster” model with its cafe bike design and style. The bike has mid-mount pegs, cafe racer bars, dual front disc brakes with ABS, 43mm upside-down forks, a 785mm seat, which is the highest in its range. The style draws inspiration from the bike builds and designs of 50s and 60s and that design appeals to a wide variety of audiences. Harley has been constantly improving the performance and the handling of the Sportster. This old legend shows no signs retiring anytime soon.